There are many benefits of horse riding. It is an outdoor recreational activity that is gaining popularity because it is healthy and beneficial to the rider. Contrary to the common misconception, horse riding is a sport that is far from an idle and passive activity. It is an exercise by itself which is both cardiovascular as well as muscle conditioning, and it improves many aspects of the rider’s life. There is little limitation of age and abilities, making horse riding accessible and enjoyable to adults and children alike. Being a form of exercise, horse riding improves respiration and blood circulation as all exercises do. What makes it different is that the activity involves having a good posture on the back of the horse for an extended period of time, which translates to better posture overall for the rider. It promotes balance and coordination during the movement of the horse and the motor function of the rider improves as a result. The rhythmic gait of the horse induces a constant need for the rider to adjust accordingly, and different muscle groups, especially pelvic muscles and postural muscles are actively being worked on. At higher speed, other muscle groups such as quadriceps and hamstrings are being worked on intensively. The constant adjustment and counter-reaction towards the horse’s natural gait, coupled with good riding posture strengthen the spine, increase joint mobility, and condition various muscle groups. A seasoned horseback rider will also develop great sensory integration with the surroundings, developing alertness and able to perceive and handle emergency situations better. 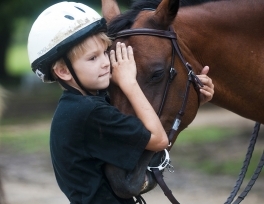 Apart from the obvious health benefits of horse riding, the mental aspect of it should not be taken lightly. Countless folks who have taken up horseback riding report the enjoyment they experience during the ride. 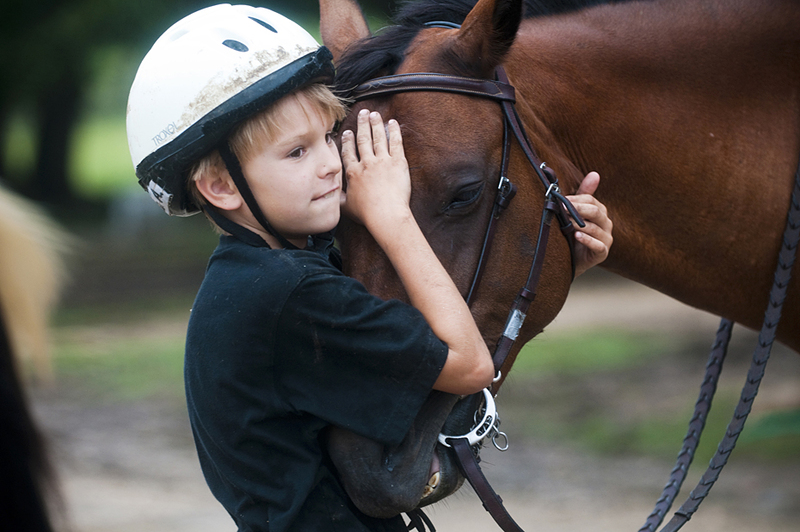 Even children who are taking horse riding lessons look forward to their next lesson. The sense of enjoyment is derived from both the joy of riding and feeling connected with the great outdoors. The breath of fresh air at the riding trails and the heartfelt enjoyment lead to lower the stress level often associated with the modern life. Riders with less stress level gradually develop a feel good factor towards themselves and this in turn makes them more positive and cheerful and the newfound optimism permeates their daily lives. As an amateur rider proceeds to become more proficient, they are constantly learning new things; be it horse riding vocabulary, coordination and balance, grooming of the horse, etc. The learning never stops while the mind never gets disengaged. This mental exercise of continuous learning keeps one alert and prevents memory loss, as studies have shown. Regular riders also develop a deep sense of trust with the horse, which consequently lead to a greater capacity to trust other people around. A horse is a large animal. In order to ride a horse properly, a rider needs to exert control and master the skills required to make the horse respond to your commands. Achieving control over a large animal instills enormous self-esteem and confidence which is beneficial in facing everyday’s challenges. The sense of control and accomplishment will help riders to handle difficult situations better because they believe every rough patch can be tamed. Learning to ride a horse proficiently is not an easy thing and the element of patience need to be cultivated. Dealing with animals as large as a horse is also perceived as risky and hence, the risk-taking abilities are sharpened. Apart from that, people who take up horse riding develop interests in the outside world and appreciation of the outdoors. This is much needed to escape from the hectic desk-bound jobs that characterize the modern society. Besides, a sense of responsibility is developed from the respect and need to care for the horse which includes regular grooming and feeding.